Gurucul Newsletter April 2018 - "Use me more for customer references"
Gurucul meets with key customer executives twice a year. Our goal for these Customer Advisory Board (CAB) meetings is to establish a strategic rapport with our customers. We offer a dynamic forum in which we gather feedback, discuss strategy and use our customers’ input to grow. Our vision for this program is to have our customers share best practices and “real-world” implementation strategies. This input is provided to our engineers and development team to help shape Gurucul’s products and services roadmap. It’s an excellent interaction which fosters peer-to-peer communication between our customers. It’s also an opportunity for our executive team to hear how our products and services are performing in the real world. We held our Spring 2018 CAB Meeting at RSA Conference this year. We had five CISO customers in attendance as well as a few of their direct reports. The quote of the month came during our conversation about customer satisfaction. It’s always dicey when you ask customers in a group setting to tell you how they really feel. Are they satisfied with your performance? This question could backfire in a big way. Then he said, “Use me more! I don’t get enough calls for customer references.” You could hear a pin drop. We were like – what did he just say? He wants more reference calls? So there you have it. If you want to talk to a happy customer about our incredible value proposition, I’ve got just the customer for you! 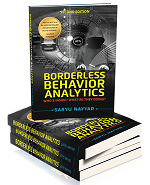 We are p leased to announce the second edition of our book, “Borderless Behavior Analytics”. We gave out a whole lot of complimentary preview copies at RSA Conference 2018. If you didn’t make it to RSA, you’ll be able to order the digital version from Amazon in a month. The second edition is literally twice the size of the first book. It features a compilation of new thought leadership articles by some of the world’s top CISOs, CSOs and CIOs. They explore the evolution of the security landscape including new threats and the latest protection models they are using and the importance of Behavior Analytics to combat modern day threats and provide business value. Allina Health Gurucul Customer Testimonial. This video shows how Allina was able to protect players’ and other VIPs health records during Super Bowl LII. Tom Brady lost the game but not his data! AWARD: Gurucul Risk Analytics platform named Most Innovative User Behavior Analytics Solution by Cyber Defense Magazine. Gurucul was selected from nearly 3,000 companies globally as the Most Innovative User Behavior Analytics solution at the RSA Conference this year,” said Pierluigi Paganini, Editor-in-Chief, Cyber Defense Magazine. RSA Conference 2018 Was a Grand Success! Multiple Fortune 50 prospects visited – some looking to replace competitive platforms as they don’t scale, aren’t automated, can’t detect unknowns, charge for data, etc. Hosted a VIP Customer Roundtable event with four CISO customer presenters who were amazing. Received a lot of interest from international customers and partners looking for a vendor with proven customer satisfaction. NH-ISAC 2018 Spring Summit. May​ 14-17​, 2018​. Sawgrass Marriott Golf Resort & Spa, Ponte Vedra Beach, FL. NH-ISAC’s mission is to enable and preserve the global public trust by advancing health sector cyber and physical security protection and the ability to prepare for and respond to cyber and physical threats and vulnerabilities. FS-ISAC Fall Summit. May​ 20​-May​ 23​, 2018​. Boca Raton, FL. This year’s theme is “Strength in Sharing.” We will connect and collaborate with customers, partners and prospects alike. Gartner Security & Risk Management Summit & Expo. June 4​-7​, 2018​. National Harbor, MD. At Gartner you’ll learn about the latest threats, flexible new security architectures, governance strategies, the chief information security officer role and more.